Spaces – Small group sharing is a new app by Google, and by the sheer fact of its existence it has spiked a lively discussion about its own purpose or usage case. We have tried the app, and here are some considerations pro and con installing yet another app from Google. It is not a chat app per se since it lacks the traditional layout of a chat app, and some of the needed features you would look in a chat app. Think of it as a group blog where members of a group can add posts, and comment on each other’s posts. 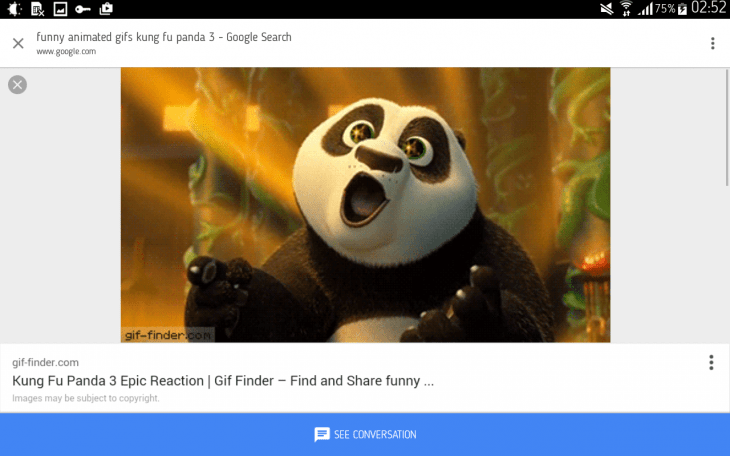 Since the app integrates in-built Google search, YouTube, Chrome and Photos, you can share pictures, YouTube videos, and various search results as your posts or comments. Here is how it works. 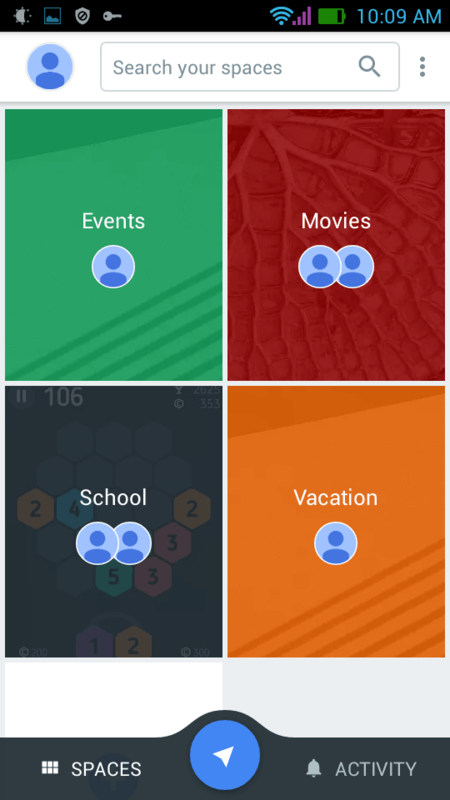 You log in with your Google account, and right off the bat you can start creating groups. The process is downright simple – tap create and the app automatically generates a featured image for your group. Give it a name, choose a color scheme for your group and start inviting people. You can send the invitations via many of your existing apps – email, chat, social network accounts, you get the idea. I sent mine via WhatsApp. You can basically just copy the link to your group and send it to someone manually. Here is where I encountered a discrepancy. As I tried joining a group by pasting its invitation link in the Spaces – Small group sharing app, nothing happened. Only when I explicitly tapped on a link in Whatsapp did the group appear in my Spaces app. Moving on to the groups. You obviously need a Google account to join a group. 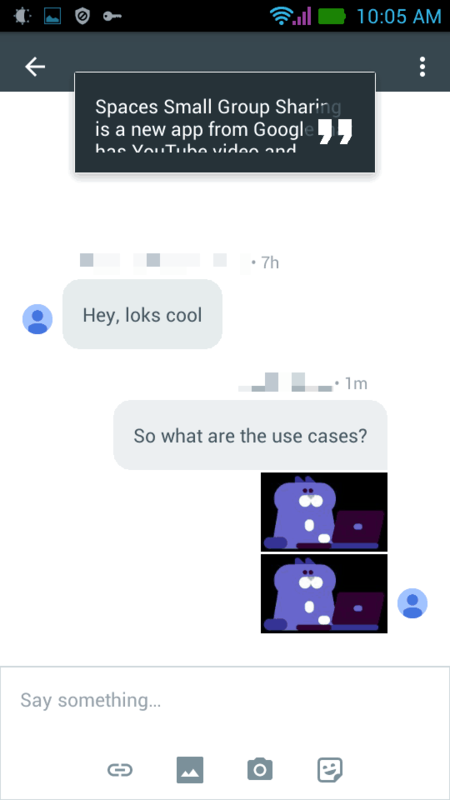 The second nag I found with the app is if your invitee has not set up a profile picture for his or her Google+ profile, you will see a blank Google person icon where you’re supposed to see the group members. There is no way to customize it on your end to be able to see who is who if the people just don’t have profile pictures. That needs to be addressed. The app does not explicitly state how many people you can add to a group, but judging by the title, not too many. A group, as I mentioned, is something like a shared blog roll, where any member can post stuff. 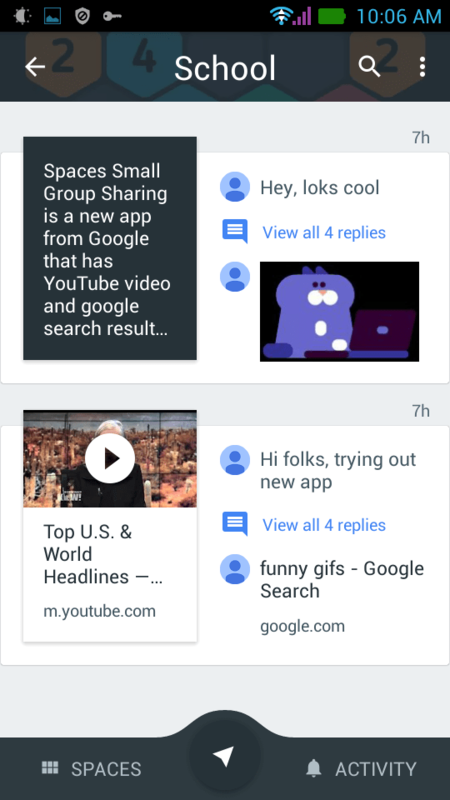 Based on the app’s purpose and integration of some basic Google services, it probably makes sense to share multimedia content available online, and some text posts that need to be highlighted, but usually get lost in the flood of a group chat in a traditional chat app. For example, when a tutor shares, say, a schedule in a WhatsApp group chat, the important message gets quickly washed away by the flood of fairly relevant questions. You need to remember to star it to be able to find it later. Spaces – Small group sharing solves that issue by letting you create posts, where the first, relevant message is highlighted in the timeline, while the comments under it are listed next to it, in small font, so the more prominent is always in your face. 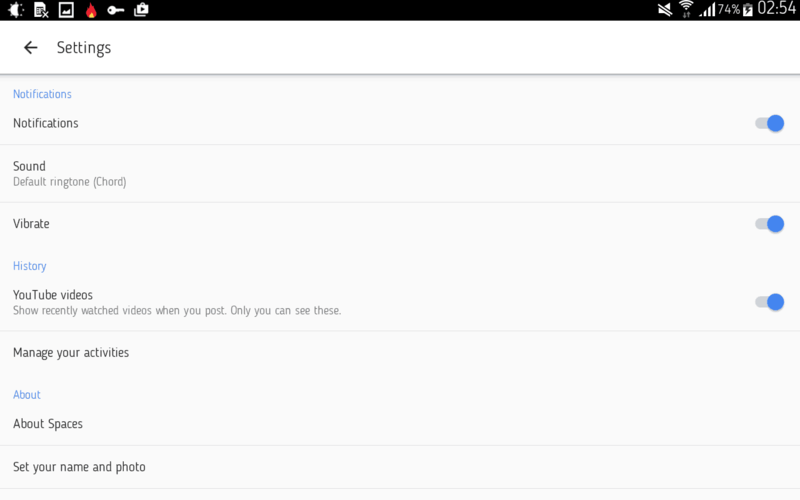 Another feature that helps you dig the important stuff is the in-group search that lets you type in the key words and see the search results from all your groups, or just one. That said, the limited choice of integrated Google apps seems lacking things like document sharing, which would spare the text notes manual typing for some. That way, it could potentially play a part of a project management platform, but then again, it seems like project management was not on the agenda for Google. At the same time, features like Categories and group Calendar, and editable messages are missing, but very welcome. It is possible to delete a message, but you can’t really edit it, which is a disadvantage. Regarding members, you can delete, block or mute a user. 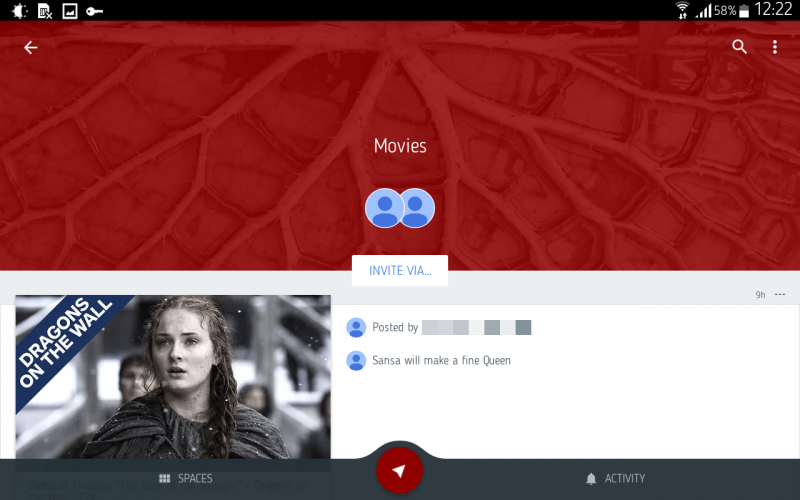 Each user can have various groups, and invite the same or different members to them. Usage cases are easy to think of – books, movies, trips, classes, events like preparations for a secret Birthday party, or a library of useful resources for any given topic you need to share with your friends or colleagues. It certainly seems like a good platform to share gift ideas or wish lists, but then again, it does not have the option to add interactive check lists. That said, the app seems half-baked the way it is now. It does not quite make the cut to seduce too many users to start using it on a regular basis. If Google wants to unify its apps and services, why not integrate the rest like Google Drive, Calendar, Hangouts, or Gmail? Another thing I disliked is the Spaces – Small group sharing app is not fully-functional if you don’t have all the integrated apps installed. Say, you want to share a GIF. So, you tap the search bar inside Spaces → Groups and use the in-built Google search to find a GIF to share. When you share it, however, it’s a link to the image, not the image itself. Now, the recipient will have to tap the link to open the image, but if they don’t have Chrome installed they will be prompted to install it. Not everyone is that much of a fan of Google breed of apps, if not for privacy reasons, but for the very fact they just don’t need yet another app. So, some users might drop out at the time of facing the need to install Chrome. That said, Spaces has a built-in library of stickers. Hello, kids. Stickers make for a serious reason to use the app. On a serious note, they are pleasantly different from the regular bunch. The design of Spaces – Small group sharing is quite Material, as you would expect. The color you select to be your group color will highlight every post. As I mentioned, the way member icons appear as profile pictures, you won’t know who said what unless your users have the pictures. Otherwise, you need to open the comments to see the names. At the beginning, it is quite difficult to get used to a layout that is so much different from what you normally get in a chat app. 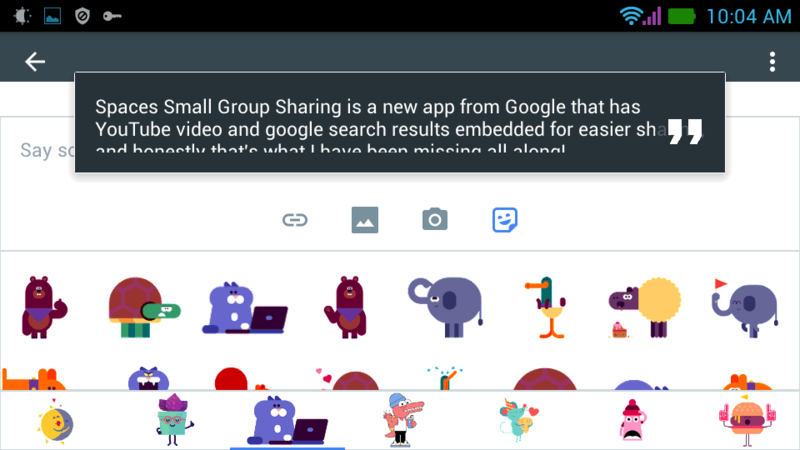 But since Spaces – Small group sharing is not a chat app, it might help treating it like a group blog posting app. It’s easy to share YouTube videos and Google search results, or Photos from Picasa. It’s easy to highlight an important message while the comments after it are visibly smaller – the blog post and comments type. It’s easy to find things with the help of a built-in search feature. It’s fun to use for assembling shared YouTube playlists. It is cross-platform and you can use it from your desktop browser. I don’t know if it’s enough to lure people from traditional group chat apps, even if they find link sharing a hassle using the traditional back and forth between the apps. Even if it’s a very legit app, it is missing integration with Google Drive, or Calendar. It does not let you customize member profile pictures. You can’t edit posts, just delete them. 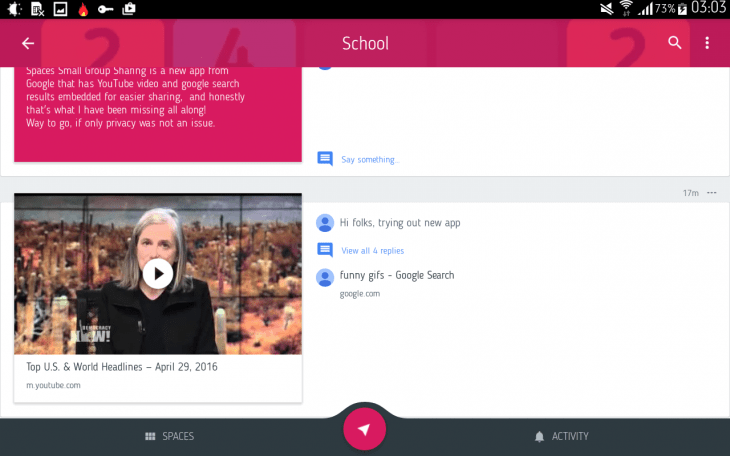 Google mysteriously hints at some very interesting usage cases of Spaces – Small group sharing at its Google I/O 2016 conference, so we will have to let them persuade us Spaces can make it to the list of your 8-12 constant monthly apps. Until then, it’s a new beast with colored feathers, but you will use it only if you have enough friends equally fond of all things Google. So, yes, Google, “getting people together” is hard, indeed. Spaces - small group sharing is a new beast with colored feathers, but you will use it only if you have enough friends equally fond of all things Google.